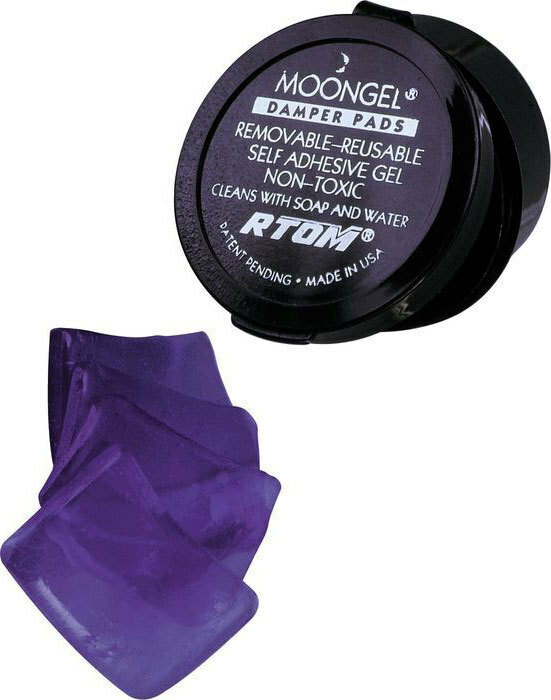 Moongel Damper Pads, Other Drum/Percussion Accessory from RTOM. mtebaldi's review"RTOM Moongel Damper Pads"
I'm a drummer. I'm originally from Brazil. I play in a band called Glint. If you ever get close to a drum kit anywhere you might find one, in a recording studio, stage, living room or basement, there is a big chance you will see some sort of muffling technique used by the drummer to kill some of the undesirable overtones in a least one of its drumheads. This was the main application for duct tape to me until I discovered Moon Gel. These small adherent blue-gel pieces not only solve the problem greatly but also give the drums a much better esthetic look than the commonly used tape. You will find this jelly material for a price ranging from $6 to $8 bucks. I love how accurate I can control overtones undesirable overtones. The slight positing move of the gel in the skin makes a huge difference sound result. Also its stickiness doesn't wears off easily, so you can reuse them more then one time. They come in a small case of four. They are made from a non-toxic gel material. This product makes the process on controlling unwanted overtones really easy. MGR/RockSteady's review"RTOM Moongel Damper Pads"
I got my 4-pack Moongel dampers from a former bandmate, who came up to me referring to them as the "New Miracle". Apparently he got it at Brookmays in Dallas, TX for $5.00. Let me tell you that my former bandmate wasn't kidding: these babies are the best thing on Earth! RTOM developed the technology that gives the dampers the exact same pressure and consistence of a human finger. Imagine you hitting your tom or snare head with a stick, and with the other hand pressuring the head to the perfect pitch and vibration. That's exactly what these dampers do for you. Give your drums the perfect pitch. Period. What I don't like? Not having discovered the Moongel Dampers earlier. They would have saved me a ton of money and headaches! Soft non-toxic gel. No metal stuff to be attached to the drum rims or anything. Pure amazing technology. Washable, durable, awesome price and 100% efficient. Go for them! Avoid buying dampers that need to be attached by clamps and all that stuff. These dampers are simply the best thing ever made in what comes to dampening drums. Try them and come back to write your review: I won't be surprised with your reaction!